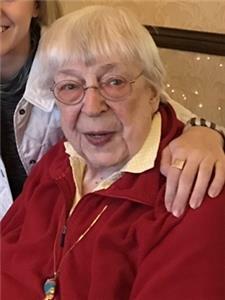 Ruby Florence Tucker, 96, of Chattanooga, passed away on Wednesday, October 10, 2018. She was a life-long resident of Chattanooga and a 77-year member of First Centenary United Methodist Church. Miss Tucker attended the Bright School, Girls Preparatory School and Wesleyan College. She was exceptionally proud of being the first woman to receive a master’s in journalism from the University of Georgia. Miss Tucker taught many years in Hamilton County at East Ridge Middle School. She was a member of the Hamilton County Education Association and served on the board of directors of the Tennessee Retired Teachers Association. Miss Tucker had an unbridled zest for living, stayed up-to-date on current events and enjoyed writing poems for her friends and family. Miss Tucker was preceded in death by her parents, Ruby Glover Tucker and Emery Gurnee Tucker, Sr., and her brothers, Emery G. Tucker, Jr. and William David Tucker. She is survived by her nieces and nephew, Emily Hogue, Ellen Dowling, Lisa Tucker, Leslie Tucker and William David Tucker, Jr. She is also survived by close friends, Brenda and Jim Tomlinson, Mary, Lori and Leah Baxter. In lieu of flowers, memorial contributions may be made to the Altar Guild First Centenary United Methodist Church, 419 McCallie Avenue, Chattanooga, TN 37402. A graveside service will be held 11 a.m. on Tuesday at Forest Hills Cemetery with Rev. Mark Gooden officiating.